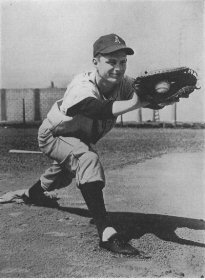 Henry Arcado Biasatti was one of six MLB players to be born in Italy. He was born on January 14th 1922 in Beano, Udine Italy, located in the far North Eastern section of Italy, bordering the Alps & the Adriatic Sea near the towns of Trieste & the country of Slovenian. As a child his family immigrated to the Windsor, Canada where he became a star baseball & basketball player growing up. He was a neighbor to future MLB Italian born player Reno Bertoia in Canada. He went off to World War II serving for his new country of Canada. He was a farmhand of the Toronto Maple Leafs baseball team, playing for London Army during the war. The team won the Canadian Congress baseball championship and played in the Ontario Baseball Association championship series in 1943 & 1945. 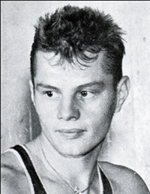 While playing minor league ball he was invited to the inaugural training camp for the Toronto Huskies in preparation for the first season of the Basketball Association of America which became the NBA. While at Assumption College he scored 11 points including the tie breaker & go ahead points to beat the Harlem Globetrotters in a huge victory for the school. He was the only Canadian born player to make the team & is cited by the NBA as being its first international player. He played six pro games for the Huskies that season. & was drafted by the Boston Celtics in 1947 but never played for them because he chose to play pro baseball instead. At this point he was at AAA in the Philadelphia Athletics organization but only batted .208 & was demoted to A ball. There he hit .298 & was sent back up to AAA, finally making the big leagues by 1949. He only spent one season at the major league level playing 21 games for the A’s as a pinch hitter & first baseman. He only batted .083 (2-24) driving in run with each of his two career hits. He got his first career RBI against Bob Lemon & Cleveland in a 14 inning game on June 22nd. 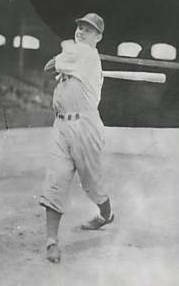 His second RBI hit came on the next to last day of the season against the Washington Senators. He did draw eight walks which gave him a career on base % of .312. Biasatti was back in the minor leagues playing through 1956, batting .277 with 85 HRs 234 RBIs in 1052 games played. In his final three years he pitched & served as the teams player / manager in the Kansas City A’s organization. Retirement: After baseball he became the head coach of Assumption University in Ontario leading them to two championships in six years of coaching. He was inducted into the Windsor/Essex County Sports Hall of Fame in 1982, the University of Windsor Alumni Sports Hall of Fame in 1986, and the Canadian Basketball Hall of Fame in 2001. Biasatti passed away in Dearborn Michigan in 1996 at the age of 74.